Everyone associated with the Oregon program has been waiting for a game like this the entire season. The Ducks made the plays at the end and outlasted No. 14 Arizona 98-93 in overtime in front of a sold out raucous crowd inside Matthew Knight Arena. With the win, Oregon placed themselves on the NCAA tournament bubble, a spot no one expected it to be just last week. After being swept in Los Angeles, the Ducks came back home to sweep the Arizona schools with a road trip up to Washington to conclude the regular season. Oregon is now 19-10 overall and 9-7 in conference play. With the loss, Arizona’s league title was postponed a bit as it fell to 12-4 and 22-7 overall. The game was overshadowed by recent allegations made by the FBI that Arizona coach Sean Miller was caught on a wiretap talking about a $100,000 payment for the services of their current 7-1 center and freshman phenom De’Andre Ayton. Miller was not at the game to coach, but Ayton was still eligible and he almost beat the Ducks single-handedly. In the first 30 minutes of the game, Ayton had 28 points and 15 rebounds. 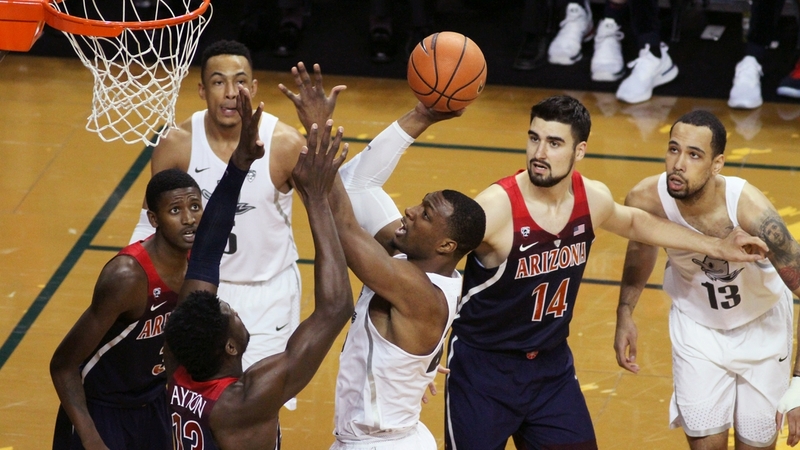 Arizona was up 13 at that point, but he didn’t score again the entire night, which allowed Oregon to rally and eventually get the upset in overtime. Senior Elijah Brown torched the Wildcats for a season-high 30 points, including going 15-of-17 from the free throw line. Fellow senior Mikyle MacIntosh added 20 points with Paul White scoring 16. The Ducks could have won the game in regulation with the score tied at 83-83. But Payton Pritchard’s running shot on the left side at the buzzer wasn’t true and Senior Night was extended for another five minutes. Pritchard did, however, get the overtime off to a good start for the Ducks with a deep three from the left elbow. The sophomore point guard wound up with 13 points, eight assists and just one turnover. Oregon turned the ball an unbelievable four times in 45 minutes of action. The Ducks managed to build up a seven-point lead at 95-88 with just over a minute left when MacIntosh nailed a three from the right corner. That could have sealed the deal, but the Wildcats were able to cut the deficit to just three at 96-93 with four second left on a deep trey. Oregon got the ball to Brown who was fouled and then he calmly made two more shots from the charity stripe. Early on it looked like Arizona and Ayton were going to take out all of their frustrations on the Ducks. The Wildcats dominated early and built an early 16-6 lead by making their first six shots from the field. They also shot nearly 60 percent from the field in the first half and wound up shooting 58 percent for the game. But Arizona turned the ball over 17 times. Oregon didn’t shoot the ball nearly as well, but it did sink 14 treys on the night. The three ball was the Ducks’ biggest weapon early on and kept them within shouting distance in the first half as they went into halftime down 43-37. The Ducks will now attempt to keep the momentum going as they go to the Palouse Thursday to take on Washington State for a 6 pm tip on ESPN2.